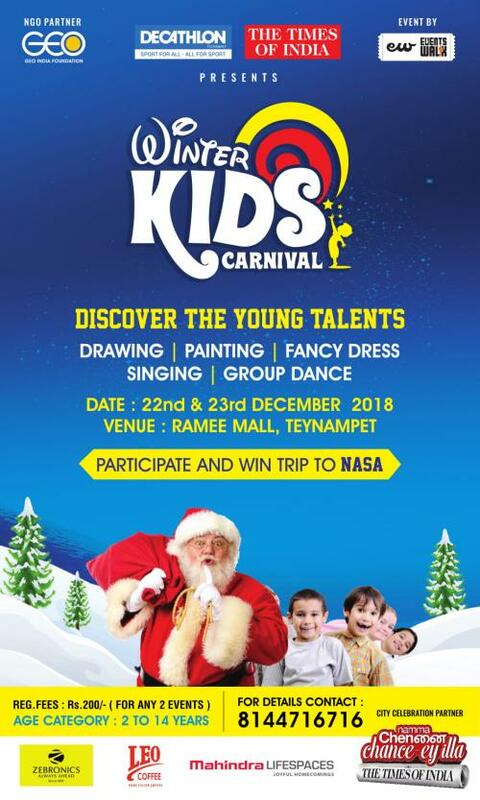 Events Walk | Winter Kids Carnival at Ramee Mall, Teynampet. Winter Kids carnival is a Children’s Day Celebration event organized by Events walk and Geo India Foundation on every year to identify the talented kids by contesting various events like Drawing, Singing, Dance, Fancy Dress etc., Participant will be between 2yrs to 14yrs and Geo India Foundation take pride in supporting World Vision an organization which takes care of the blind children. Hi. I tired calling the number mentioned above to register but could not reach. How can we Register for the events ? Registration Link is available above. What are all the events going to be conducted. How could I register this. I don’t have paytm. Can I register directly. Story telling and coloring competition is conducting there.